In a massive storm with gale force winds between 70 and 90km per hour which started on Oct 10, 2017, around 9 a.m. the container ship “SM New York” ran aground in Durban shortly after unmooring and was attended by the “Smit Siyanda” (IMO: 9479709), and the container ships “MSC Ines” and “MSC Susanna”, which both had been about to leave port, were blown away by storm gusts. The “MSC Ines” also ran aground, getting stuck perpendicular to the access channel, and timewise blocked the port. 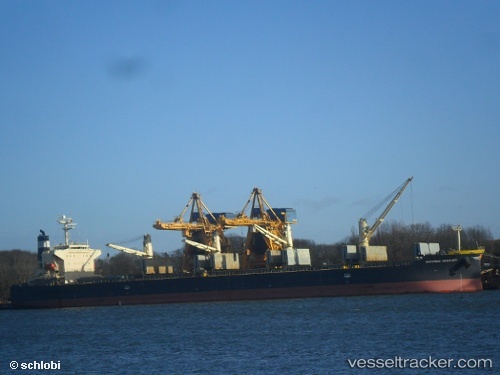 She was pulled to the Coal Terminal at 5 p.m. by the tugs “Lotheni” (MMSI: 601135800), Siyakhula” (IMO: 9501409) and “Umbilo” (MMSI: 601124000). 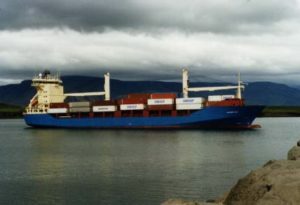 The “MSC Susanna” was taken in tow by four tugs and taken back to the Ro-Ro and MPT Terminal at 1.15 p.m. The tanker “Bow Triumph” ran aground after broking off moorings. The “Maritime Newanda” drifted aground after breaking off its moorings at the Maydon Wharf. According to another source, she drifted into a nearby barge, which was probably anchored, and was stuck to barge. all vessel movements had been suspended in the Port of Durban due to inclement weather. The inclement weather also disrupted operations at the Port of Richards Bay. Transnet’s marine services team and tugs were assisting with several emergencies. A man was killed after a 40-foot-container was blown over and landed on top of his car near the Durban port. One man, who was approximately 30-years-old, sustained relatively minor injuries but was trapped inside the car when the roof collapsed under the weight of the container. He was in a stable condition and was transported by ambulance to hospital for further assessment and care. The second occupant, believed to be in his forties, sustained severe injuries and died at the scene. Several other large and heavy stacked containers in different areas were also blown over by the strong winds. Yachts and boats in the small craft harbour and at the Point Yacht Club (PYC) have broken from their moorings. NSRI Durban rescue crews are at PYC assisting to corral boats and yachts adrift in the port.